Microsoft's conceptual tablet, Courier, may be long dead, but its spirit lives on. Earlier this week, two apps were released by developers with ties to the Courier project team. 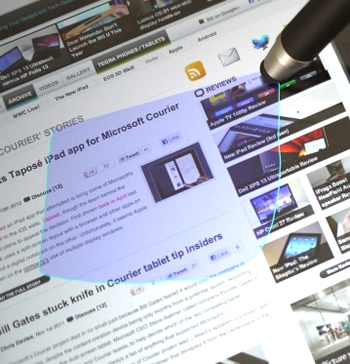 The apps, Taposé and Paper, bring to the iPad some of the cool concepts introduced with Courier's UI. Well, that is if it hadn't met its early demise in 2010, of course. Although originally nixed from approval by Apple, Taposé was finally approved to much fanfare by the company. Taposé, in particular, seems to embody the gestalt of Courier's elegance in what has continued to be a Courier-free world. The original tablet was intended to sport two screens, so the iPad app is ideally suited for landscape mode where it divides the screen into two virtual halves. The side-by-side windows make for a potentially efficient workspace, allowing users to view two items at once, drag items between them and flip through book-like screens with a swipe of the finger. Taposé includes facilities for an integrated journal, maps, contacts, notes, drawing, word processing, printing, media center and multi-tasking within the app. It also ties all of this together with cloud-based synchronization and storage. It attempts to deliver its own Courier-like experience by providing its own ecosystem based on an apps-within-an-app approach. Paper, also by former Courier developers, is far narrower in focus. It's strictly a drawing app and appears to be very similar to Adobe Eazel or Sketchbook in nature. Although there are some good things to say about the app, such as high-res Retina support and an attractive interface, the color palette is limited to a handful of earthy colors and additional pen types will set you back $1.99 a pop -- as much as some similar apps cost in their entirety.